No job is more of a pressure cooker than being a White House press secretary…especially in this White House. For more than two decades, Sean Spicer had been a respected political insider, working as a campaign and communications strategist. But in December 2016, he got the call of a lifetime. President-elect Donald J. Trump had chosen him to be the White House press secretary. And life hasn’t been the same since. When he accepted the job, Spicer was far from a household name. But then he walked into the bright lights of the briefing room, and the cameras started rolling. His every word was scrutinized. Every movement was parodied. Every detail became a meme. And that’s just the public side. Behind the scenes, things were almost as difficult in an administration plagued by leaks that frustrated and angered both Spicer and the president. Not to mention the extraordinary pressures on Spicer’s family and his faith. 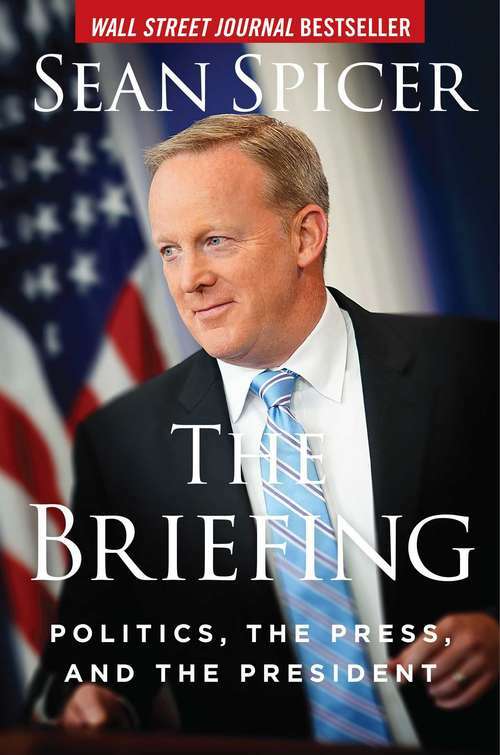 Now, in his provocative and enlightening political memoir, The Briefing, Spicer reveals the truth behind some of the biggest news stories of our time, and he offers a glimpse into what it’s like to stand at the press secretary’s podium—and how he got there. The Briefing is the first insider account written by someone who worked on the Trump campaign, with the Trump transition team, and in the Trump White House—and has seen Donald Trump rallying voters, building an administration, and making crucial policy decisions. Spicer’s riveting and personal account makes The Briefing the must-read political book of the year.